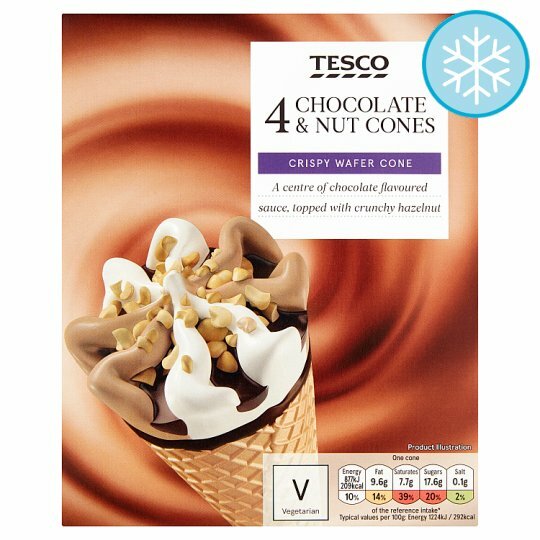 Chocolate and vanilla flavour ice creams in a wafer cone coated with chocolate flavoured coating, rippled with chocolate flavoured sauce, finished with chocolate flavoured topping and hazelnut pieces. Partially Reconstituted Skimmed Milk Concentrate, Sugar, Wheat Flour, Chocolate Flavoured Sauce (9%), Coconut Oil, Glucose Syrup, Sunflower Oil, Hazelnuts (2%), Fat Reduced Cocoa Powder, Dark Chocolate, Emulsifiers (Soya Lecithins, Mono- and Di-Glycerides of Fatty Acids), Whey Powder (Milk), Stabilisers (Carob Gum, Guar Gum), Flavourings. Chocolate Flavoured Sauce contains: Glucose Syrup, Water, Sugar, Fat Reduced Cocoa Powder, Cocoa Mass, Skimmed Milk, Gelling Agent (Pectin), Salt. Dark Chocolate contains: Cocoa Mass, Sugar, Cocoa Butter, Fat Reduced Cocoa Powder, Emulsifier (Soya Lecithins).